Most of us have, at one time or another, grabbed a bag of frozen peas from the freezer to ease the pain of an injury. We all know that cold helps numb pain, and there are even ice sprays on the market which work the opposite way to heat treatment creams. Ice can help to minimize swelling and reduce pain. Knee pain can be incredibly debilitating to suffer from. It can take you from living an active lifestyle to a sedentary couch potato way of life in a flash. Whether you’re recovering from knee surgery, dealing with a sprain or just aching after daily wear and tear, using the best ice pack for knee pain will help you to recover. Cold therapy is one of the best ways of tackling that nagging pain. Want to know more about ice packs for the knee? Having a good knee ice wrap or pack and knowing how to use it properly can be essential for athletes, people who spend longer periods of the working day on their feet or just anyone dealing with knee issues. For somebody recovering from knee replacement surgery, applying an ice pack to the knee can be a daily event. After considering many factors to look at when choosing the best ice pack for knee treatment, we’ll feature some of the top selling ice packs available today. Also available with 2 Gel Packs for greater money-saving value. COLDER FOR LONGER: Proprietary clay cold pack stays colder for longer than bentonite ice wraps. MORE FLEXIBLE: Professional-grade clay interior stays pliable when frozen to conform to any body part. MONEY-SAVING 2 PACK: Also see our famous Single Pack and 3 additional cold pack sizes. Knee pain is the second biggest complaint of chronic pain in the US. Whether your knee pain has been caused by a recent injury, happened gradually over the years or is the result of an older injury, you need relief from the pain, and you need it quick. There’s nothing like knee pain to make you realize just how much you use your knees. The knees are one of the most vulnerable parts of the body. Not only do they have to bear your weight but they also have to be capable of twisting and turning. Instability in the knee can quickly lead to more serious injuries. Offer instant relief by numbing the pain. Reduce inflammation which may be causing the pain and stiffness of the joint. Manage swelling—another major cause of joint pain. For common sprains or strains an at-home treatment plan called RICE is often used. Rest, Ice, Compression and Elevation is something you can easily perform with the best ice pack for knee pain. Runners can also benefit greatly from using knee ice packs. Running is a repetitive motion which results in wear and tear of the knees. Ice has been widely recognized as the best treatment for addressing the general inflammation caused by running and any acute injuries that may result. When looking for an ice pack you should try to find one that maintains a consistent temperature and doesn’t melt too fast or at the other end of the scale, get so cold it burns your skin. An ice pack that lasts longer will prevent you from having to get up and down to refreeze it, which can place more stress on the knee. The material of the ice pack should be soft and high quality (to protect your skin from the cold), and well constructed to avoid leakage as some gels inside these packs can be very messy. If the ice pack is intended for wearing while performing daily duties ensure it’s flexible enough to allow for mobility. The fit of the ice pack will also determine how effective it is. Gels or clays that freeze but remain pliable will mold better to the contour of your body with a secure-fitting ice pack. A pack or strap that’s too loose won’t be as effective, but one that’s too tight will create more problems for your knees. If you plan to be active, look for an ice pack that has a wrap around design and keeps it secured to your leg. Depending on the severity of your knee injury, you may want some extra support from your ice pack to make sure you remain safe while wearing it. 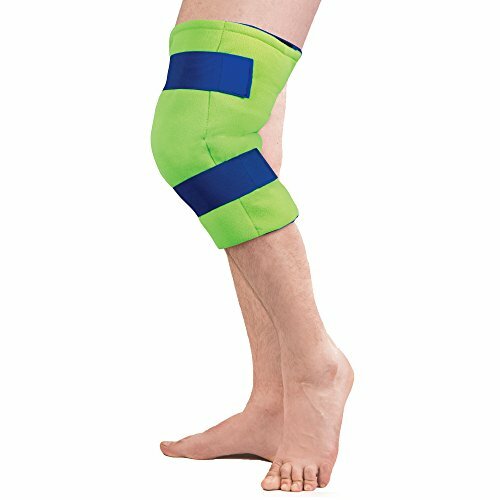 Many two-in-one designs now feature an ice pack in a brace or compression-style design. Flexibility of the material should offer compression and mobility but keep the cold next to your skin and prevent the ice from moving around. With so many different treatment and recovery options for knee pain and injuries it can be difficult to know which to choose. A doctor will advise of the best option following surgery or if you consult them about any further severe pains. If you’ve decided to follow the ice compression method, we’ve looked at some of the best selling ice packs to find the best ice pack for knee pain. Although not specifically marketed as an ice pack for the knee, the versatility of this wrap means it can be effective for the treatment of knees, ankles, shoulders or any other part of the body. And at a bargain price of around $10 it’s a perfect go-to emergency ice wrap to keep in your cupboard. This wrap use a clay which remains soft and pliable when frozen so it molds to the affected body part. A compact wrap it comes with a 5 x 10 inches ice pack and a 24-inch nylon strap to hold it on. This wrap is lightweight and comfortable to wear around the knee or wherever you need the cold therapy to soothe the swelling or pain. For runners or other athletes it’s ideal for putting in your kit bag for post-exercise relief from aches, pains and potential strains. it’s easy to carry around. Proprietary clay remains soft and pliable to conform to the shape of your body parts. Stays colder than liquid ice packs and won’t slide around like many gel packs. Strap is easy to wrap around the knee so you don’t have to carry it round. Velcro strap keeps it secure. wrists and even the neck or shoulders. The clay only remains cold for a specific amount of time regardless of how long you freeze it. Doesn’t freeze completely and only moderate amount of cold. Size is too small to cover larger injuries. For ease of use they don’t come much easier than this premium knee wrap by A to P Total Knee Wraps. A unique design offers a complete wrap around the knee solution and covers from the mid-calf to mid-thigh area, perfect if the pain or injury has spread from the knee. Three adjustable straps with Velcro closures makes it highly adjustable yet still fits securely to the leg and doesn’t slip around. One size is designed to fit all thighs from 13 to 26 inches and it uses three removable ice inserts for full coverage all the way from your calf to thigh. You can also buy additional ice packs if you want to wear it for longer periods and simply swap out the packs for colder ones. The only downside is the packs are not gel and freeze solid which can be uncomfortable if your knee is tender. Covers a large area for full relief from radiating pain. Allows full mobility of joints. Three strap design means it stays on. 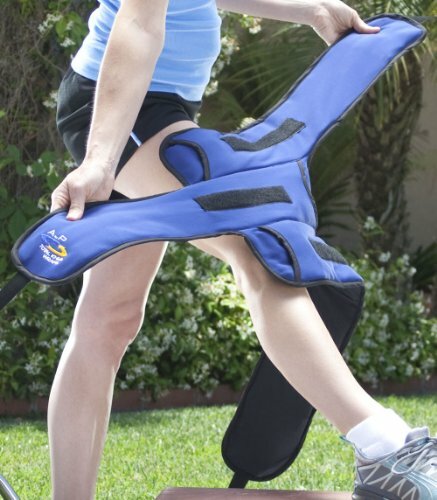 Ideal for people recovering from knee surgery or knee replacement. Ice packs stay cold for long time. no flexibility at all—many customers have complained of sharp edges further damaging the injured knee. Not a perfectly secure fit with some customers saying it slipped while being worn. but could be worth it following knee replacement surgery if you need full coverage. No return policy after 14 days unless product is found to be faulty. 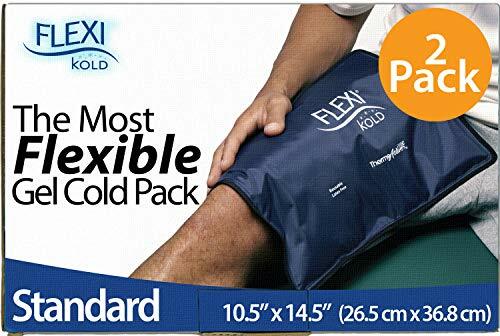 If you want an ice pack that covers a larger area of the knee or can be used on another body part too, this ice pack could be the ideal choice for you. With an option of standard size (10.5 x 14.5 inches) or oversize (13 x 21.5 inches) you can choose one that’s easy to store or a larger one for a huge injury. There are even twin packs available of the standard size so you always have a spare. These gel packs will stay colder than many of the common bentonite formula packs with a proprietary gel that remains flexible when frozen, even at the lowest of temperatures. The inner gel conforms to any body part when frozen, particularly handy for knee injuries or recovery from knee surgery. A heavy-duty dark blue nylon exterior has double sealed seamed edges to make it more secure and durable. Flexible design is recommended and preferred by many healthcare specialists and physical therapists across the USA. Wide range of sizes and packs available. Stays colder longer than bentonite. Durable design with double seal makes it less likely to leak. Nylon is softer to the touch and more soothing. with price increasing for larger sizes. Gel is very messy if it should leak. Gel may move around when pack is applied and not stay all over the injury. This one-size-fits-all ice knee wrap features adjustable straps which allow you to control the compression level and personalize the fit to your knee. A heavy duty blend of nylon and polyester is designed to be flexible and stay in place when running or jumping. The cold pack remains flexible and soft even when frozen. The Therapaq ice pack knee wrap can be used for either cold or hot therapy with a reusable gel pack that freezes in just 90 minutes. For strained, injured and stiff joints, knee swelling or inflammation, the ice pack will ease the pain while the compression sleeve encourages a faster recovery. Therapaq is so sure you’ll like this product it offers an unconditional money back guarantee at anytime! A quality compression sleeve and ice pack for the knee in one. Strong durable fabric offers support yet remains flexible enough for daily activities and even physical exercises. Perfect for arthritis or other conditions where you may wish to ease the pain on a more long-term basis. Can be used either hot or cold—just place pad in freezer or heat in microwave for heat treatment. especially those with larger thighs or calves. although some users state they got a full hour—more suited for periodic ice treatment of the knee. A soft fleece between your skin and the cold makes this one of the most comfortable ice packs to wear and protects from frostbite. A slim, comfortable sleeve this securely wraps around the knee and provides 360 degrees cold therapy to both the front and back of the knee. The larger surface area allows a wider expanse of injury to be treated. Encapsulated ice packs are filled with liquid for a dual effect of ice and compression, being more adequate for the healing process. An adjustable hook and loop closure means you don’t have to hold the pack on. Extending from the mid-calf to just above the knee this is an effective treatment for bruising, sprains or injuries. Ideal for use post-surgery or after physical exercise. Compact and easy to carry size. Strap makes it easy to wrap around your knee so you don’t have to hold it in place. Soft fleece finish makes it soft on skin and ultra comfortable to wear. Slim profile makes it easy to walk around with on your knee. Soft pliable liquid molds to the knee. Ice packs are not evenly distributed and can move about making the wrap uncomfortable to wear. Seams are not well constructed and many complaints of them coming apart and insides leaking out. Strap tends to run small—may struggle to wrap around larger knees. Choosing the correct ice pack for your knee pain or injury can be the first step to recovery. Joint pain is a serious issue which can stop you from being active and will impact your whole lifestyle. 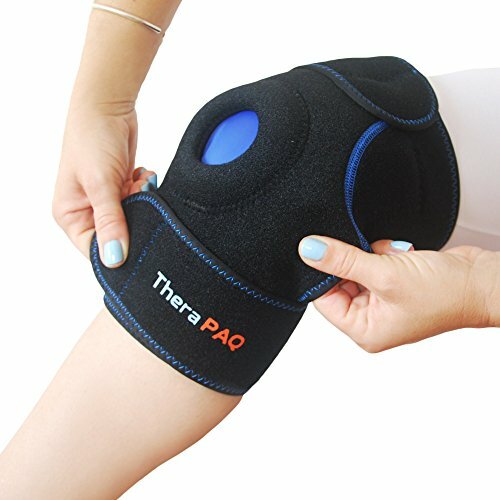 The Knee Ice Pack from A to P was a high-quality complete solution but the expensive price and ice packs that freeze solid prevented it from being our favorite. 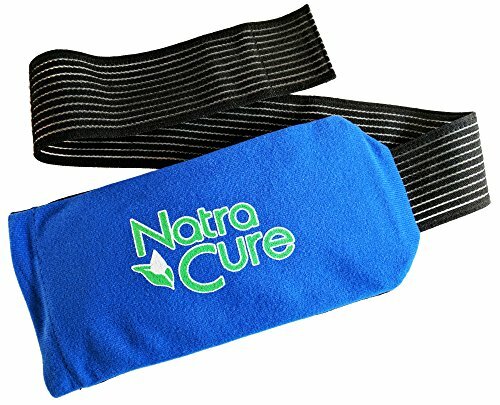 The value for money and versatility offered by the NatraCure Universal Cold Pack Ice Wrap, in our opinion, makes it the best ice pack for knee injuries. Once you’ve dealt with that knee pain, you can put it to work on any other painful joints or parts of the body. Time to throw away that bag of frozen peas (or you could even try eating them next time! ).